Mar Roxas made it official today. He is running for vice president. His move to step down and be a vice presidential aspirant to give way to Noynoy Aquino is seen by most people as a heroic deed. For some, it is seen as a last ditch effort to win as he has been slipping down in the recent SWS surveys. Whatever his real motives may be, the recent dramatic turnout of events within the Liberal Party is surely sending yellow euphoric waves in the country. This early, the tandem of Noynoy Aquino and Mar Roxas seems like the Great Wall. Indestructible. Mar Roxas was hanging on the balance already, but he soon found his formidable footing in the vice-presidential slot. After all, who are his contenders so far? Ronaldo Puno? Willie Revillame? Mar's unsuspecting savior turned out to be his buddy Noynoy. But the tandem mutually benefits them really because by its virtue, Mar also brings Noynoy closer to the masses. This gives Noynoy the opportunity to disclose himself to these people, not just to the bourgeois and elites. 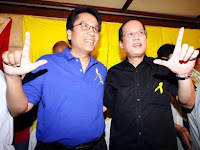 In a way, Noynoy also inherits Mar's slogan, Lalaban tayo! And Mar will flash the Laban sign in his campaigns. For a while there, I thought that Noynoy Aquino will not stand a chance in winning. But today, it is mesmerizing to see the outpour of support being given to him and Mar Roxas. Indeed, the clamor for change of administration is on the throats of the people already. Still, the road to the election day is very far ahead. Noynoy and Mar will have to go to highs and lows to get their needed votes. There's the vast political machinery of Lakas-Kampi, first and foremost, against the Piso-piso campaign. Anyways, I'm still enjoying the show. Noynoy and Mar are very popular now but it is still too early to tell. Again, I hope people will be very discerning this time around. We've made lots of mistakes in the past putting into power those public officials we so hate right now. Let's not commit the same mistakes twice over.